See? 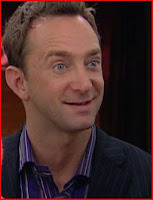 It’s not just the Clinton Kelly eyes that can distract me. who under no circumstances are allowed to utter a sound, lest they break the spell…which begs the question: What do they do if they’re going to sneeze? Are they allowed to sneeze? It must get really gross in there if they do…and what happens if they mistakenly say “Thank you" when someone blesses them? Connor picked Abraham Lincoln. “Why?” you ask. Good question…with a rather simplistic answer: he says he likes the hat. For weeks now, they’ve been working on their “bio” info…gathering and cataloguing and practicing. Most of the students are looking forward to this event, but not Connor. He wanted no part of it and in no uncertain terms dragged his feet every chance he got. He was also often heard muttering derogatory anti-Lincoln comments as recently as this morning, when he announced that he had a wickedly sore throat. “But…the Bio Bash is tomorrow…and he really doesn’t want to do it,” I sputter, by way of explanation. “Well, you can’t fake a fever” is Mary’s reply…and then there’s this long pause. I’m there in a flash and then it’s off to the local “IN-OUT-DONE” drive-through medical place near our house, which may take patients on a first-come-first-served basis, but it’s still faster and easier than getting an appointment with our pediatrician. I’ve noticed however, that over the last two years, what was once a well-kept-secret is now a well-known commodity and everyone’s going there… which is bad for us. So, we sit. And we wait. We amuse ourselves by wagering (a cool quarter) on what the guy is gonna do with the orange ladder sitting in the middle of the room…Connor guesses he’s replacing some ceiling tiles, I’m banking on him checking the smoke detectors wiring. (We were both correct, so it was a wash.) We amazingly get the poor woman across from us to laugh out loud, an amazing feat if you saw what she looked like. She’d just returned on a redeye from Memphis and felt like crap. Honestly, she looked it, too. She and Connor shared the same symptoms, so we proclaimed her “ENT with fever” and Connor was “fever and sore throat boy”. This went on for almost an hour. Whilst waiting in the “inner” waiting room, I offered Connor our favorite waiting room game, whereby he closes his eyes and must guess the contents of my bag. Items are produced and placed into his upturned hand…a tape measure, a portable package of tissues, a teeny bottle of Purell, a misshapen Power Bar. The physician-du-jour will often stand silently and watch this activity with more than a little amusement before interrupting to do the whole eyes, ears, throat and stethoscope routine, followed by the inevitable swabbing-of-the-throat. Connor has strep. Unbelievable. Now he’s on antibiotics and Bio Bash is not happenin’…at least, not for him. Tonight, he’s informed me it’s just as well…he’d completely forgotten to put together a costume. Lucky Connor! Do you think he connocted strep in science class & licked the stick so that he'd avoid history class? Funny byline!